A piece of jewelry echoes a region's rich heritage, aesthetics and sensibilities and Assamese jewelry does not differ from that. A piece of jewelry not just enhances the wearer's beauty but identity as well. A land of flamboyant rivers engulfed in exotic flora and fauna, birds, musical instruments Assamese jewelry is highly inspired by that. Sharing a few assamese pieces of jewelry from my personal collection. An Assamese bride's dress up is incomplete without Assamese jewelry. Traditionally Assamese jewelry is purely handmade. The main frame is made out with 24-carat gold and lac is used as a filling material. Stones are studded on the top. 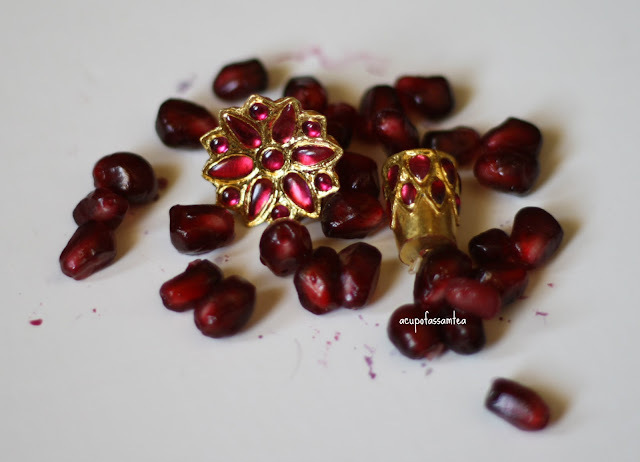 The creatively and meticulously studded stone craftsmanship resembles with pomegranate seeds. The color and texture of the stone are opulent and lurid just like pomegranate. Nowadays imitation Assamese jewelry are also found in silver with gold plating called Kesa Sun (raw gold). 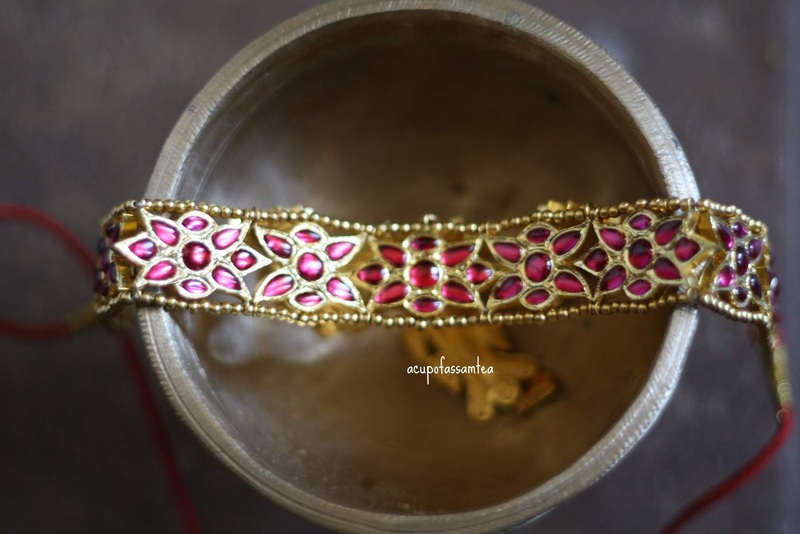 The main manufacturer of Assamese jewelry is divided typically in three reasons Jorhat, Nagaon, and Barpeta. Every reason's jewelry has its own specialty. Jorhat and Nagaon jewelry are more stone embedded and Barpeta jewelry is intricate gold work with just one stone or no stone. 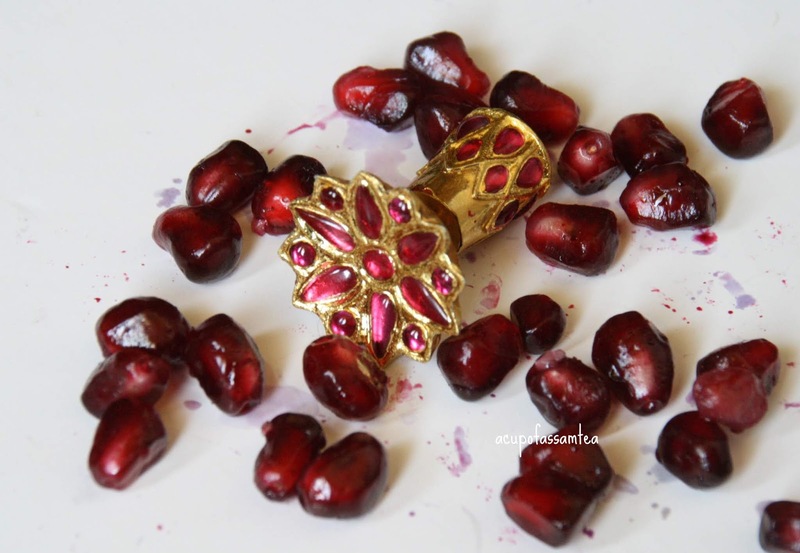 Red is the predominant color in Assamese jewelry but the modern Assamese jewelry can be found in any color you want. 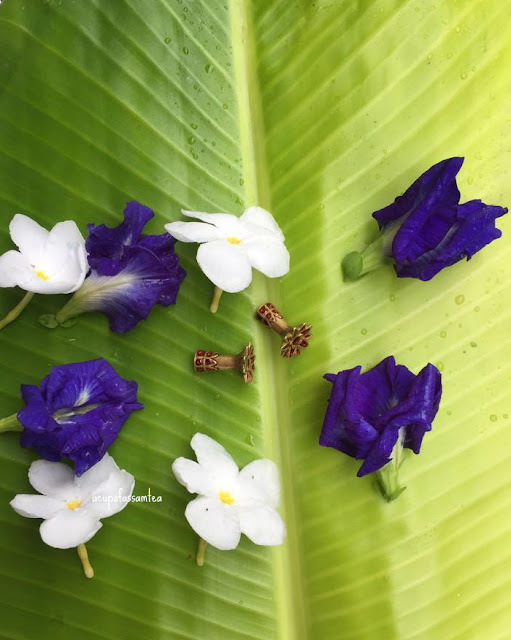 Thuria : A pair of stone studded earring a flower of the top and a cylindrical shape on bottom attach called it as old woman jewelry because you order to have a big hole to wear it. Today modern thuria can be partable and you can easily wear it without a big hole or no need to grow old. 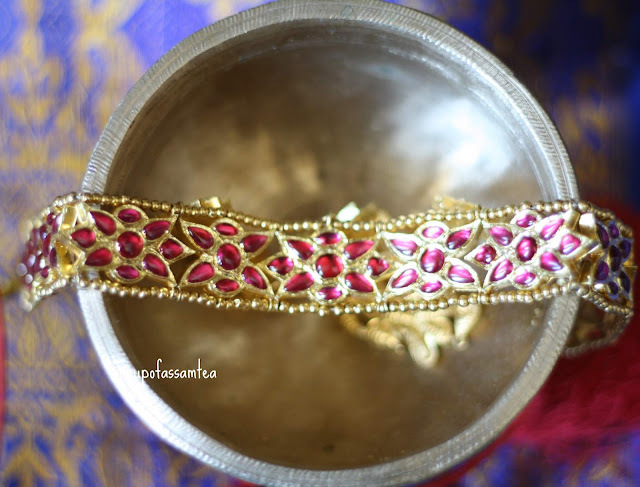 Golpota: Assamese choker or golpota probably my favorite piece of assamese jewelry. Statement and elegant and totally worth it. Bena : This piece of jewelry is very close to my heart. Got it from my parents during my wedding. A moon shape and sides are twisted yet again stone studded. The traditional version is red, this is more modern green in color. Suna or Xuna : A statement Assamese earring with intricate gold work, a chain on the side, a red stone to enhance the beauty. Handmade pure gold manufactured in Barpeta and can be easily found in imitation as well. This is a kind of unfamiliar jewelry! And I just wanna say! It's very brilliant! Thanks to sharing this post! These pieces are beautiful. I love the teal/green with the heart in the middle. "Intricate work" indeed. Good post! These are beautiful pieces. I can’t believe they are all handmade. Amazing colors. So beautiful. I love all of these pieces. The fact that they are handmade makes them so unique! I love love love that choker! I also like how you staged the photographs. I bet that pomegranate was messy. LOL! Wow such beautiful jewelry and photos. How special to have your grandmothers collection. Thanks for sharing! 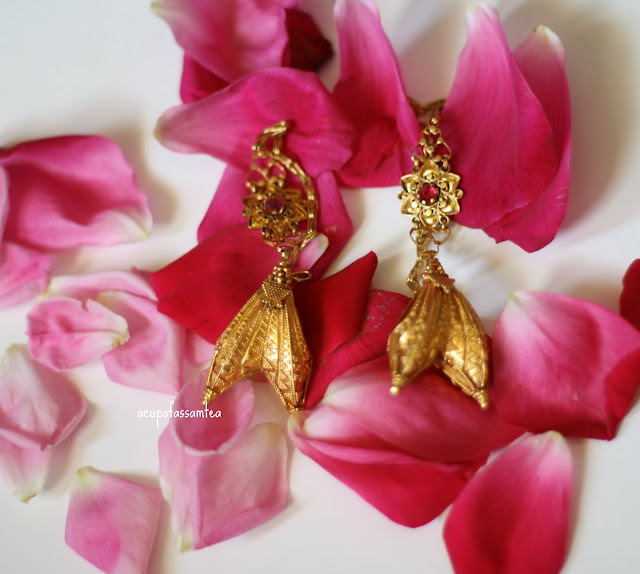 This is a gorgeous collection of Assamese jewelry. 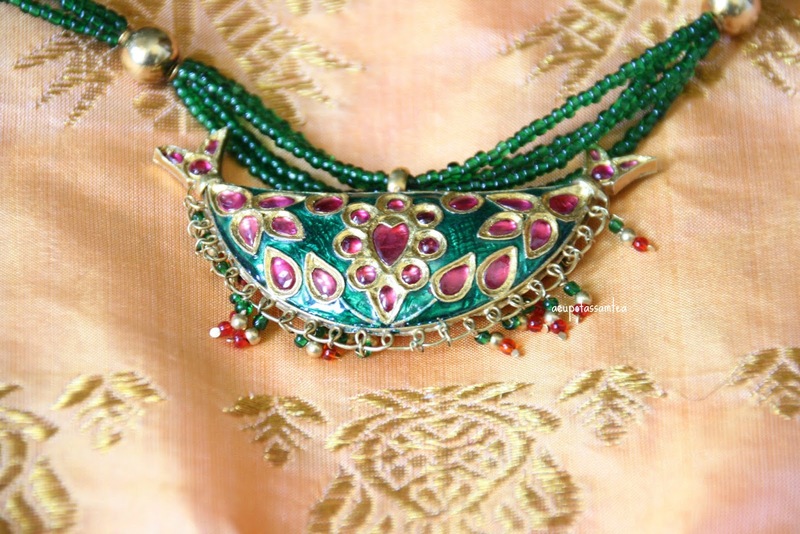 Love the rich colors and the intricate details! While these aren't my style.these are very pretty! You picked some really gorgeous pieces of jewellery here, I love the ruby red colours and the intricate designs! These are beautiful! I love the choker and the beautiful colors! The pieces of jewelry are so colorful and look like they have a story to tell. Do you wear the pieces every day or do you wear them for special occasions (or a combination of the two)? I've never heard of this kind of jewelry before but I am huge fan! What a beautiful collection. I love jewellery with touches of culture and ethnicity. These pieces are so beautiful, love the details. The choker and suna looks so gorgeous. These are beautiful jewelry pieces! Now I would love to find and have one for myself! Beautiful pieces and I love the story and history!